To the lovely north of Scotland…Day 4..Thurso to Lochcarron. 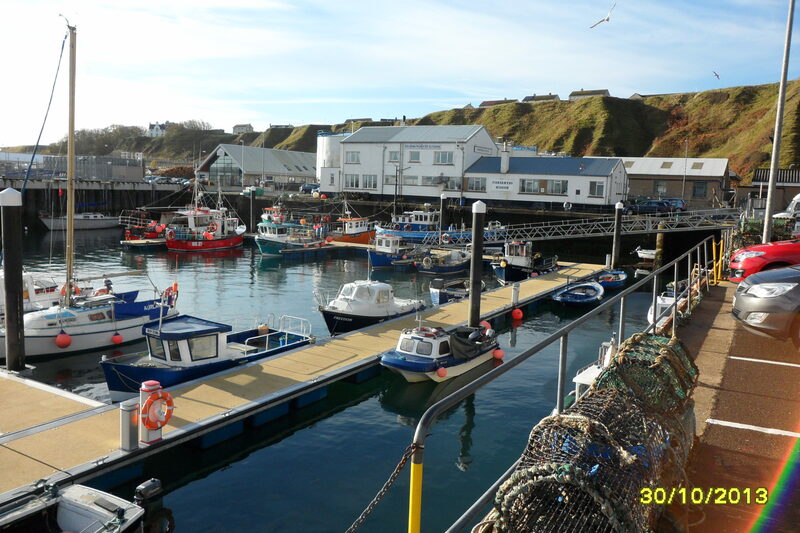 It was now Wednesday 30th October, and after another super breakfast, we were to head west from Thurso, on a gorgeous day. When we ate last night at near-by Scrabster, it was dark, so we wanted to see the harbour in the light. A simple place, but the lorries were leaving in numbers, with their marine cargo in refrigerated containers, to presumably the nearest station to continue their journey to the tables of London and beyond. 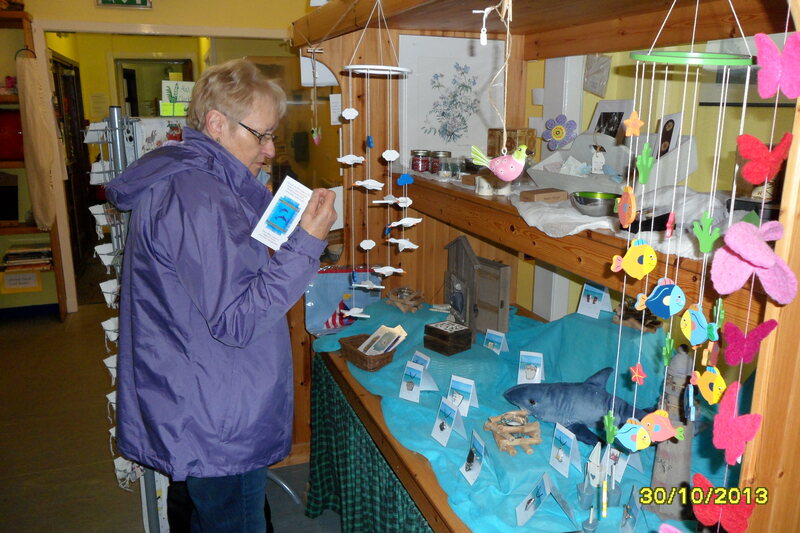 We only had one thing to do in Thurso itself; get a postcard for a niece and family. We have always done this and it HAS to be about the town. Chatting with the shop staff, we mentioned that a nephew was married to a local girl, whose family still lived in Thurso. It was inevitable that they were known, and we might have enticed a few skeletons from the cupboard if more time had been available! 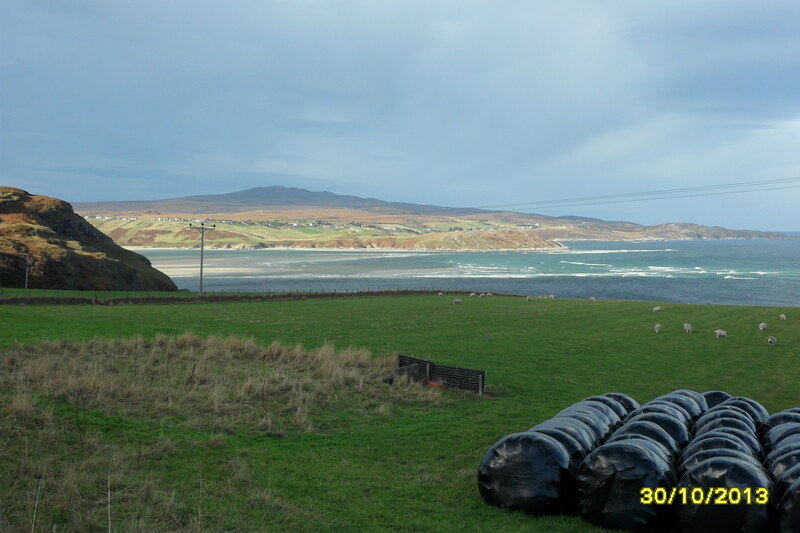 The A836 follows the north coast from John O’Groats in the east, to Tongue, and then heads south to the Dornoch Firth, through very-varied scenery. Not far from Thurso we met a lot of wind turbines (turning, or stopped as required), then the wave power of the north Atlantic. But most interesting was seeing the Dounreay Power Station, near Reay village, again after some 40 years, when it was at the height of its power generation. Now decommissioned, I fully expected to see a rusting hulk or half-demolished sheds. 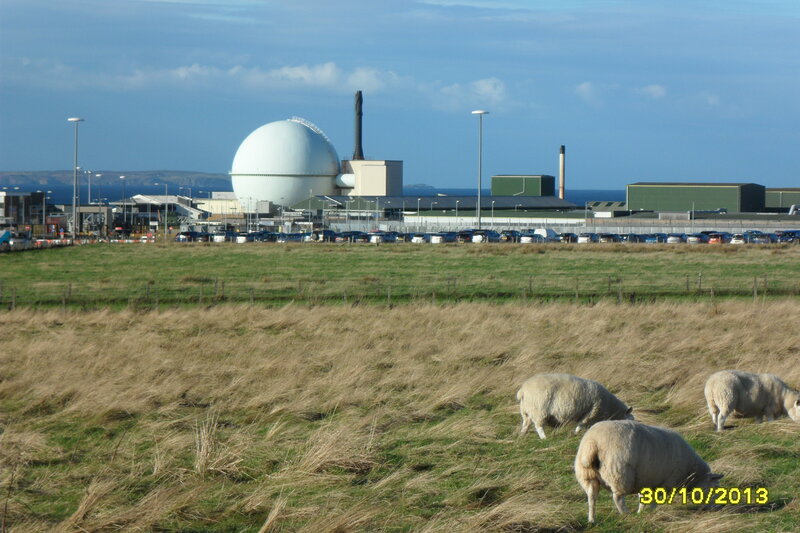 Pleasantly surprised at how attractive it still looked, whatever concerns we might have about nuclear safety…..and the sheep seemed quite unaware of the technology so close to them. I wanted a photo of Dounreay from another direction, and just past Portskerra, when a little track ran out onto Strathy Point, we took it. Up here the roads are in good condition, and I got my desired shot. Returning to the main road we saw work on a ‘bothy’ which is now used as an animal shelter. For the next 20 miles, till we got to Tongue, we were treated to some of the loveliest scenery I have ever seen, with massive beaches, headlands, gentle valleys and deep clefts in the coastline. 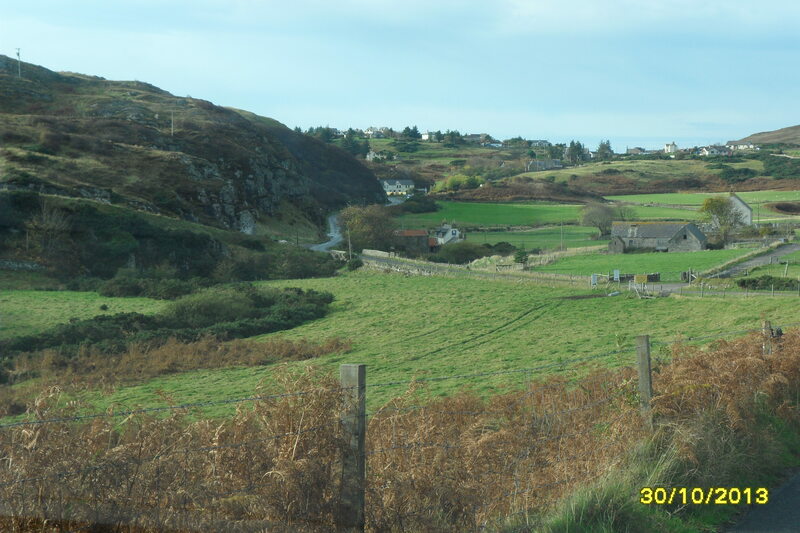 I have let some photos speak for themselves, and then we will renew our journey…..
After this beautiful scenery on the coast, the road went south just before Tongue, and we headed for Crask Inn for lunch. It is a well-known place, not just in the area, but on Trip-Advisor. One is well-warned that it is not a ‘normal’ inn, as it is run by farmers, and takes a pragmatic attitude to serving food, drink, and accommodation. When we arrived about lunchtime, there were no cars about, so I parked opposite and went to the front door, opened and looked in. There was a nice little bar, but no-one about. Back to car, to be followed by a lady who asked if we had been looking for something. She didn’t seem worried t0 lose potential business…..and we drove off. However I’m sure it’s better in the evening! 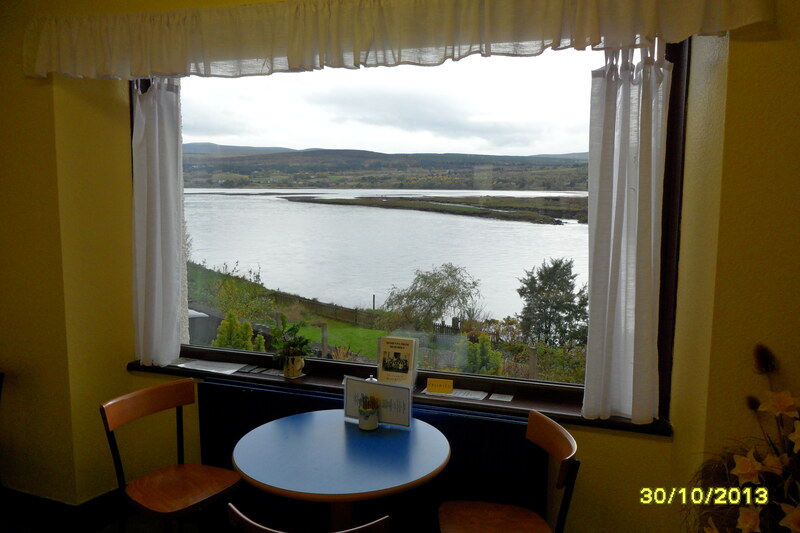 Minimal lunch came courtesy of our cool-box in the car, and another 20 miles or so took us to The Cally Café, at Bonar Bridge, at the western end of the Dornoch Firth. It’s a pleasure going in here as the staff are so friendly, so hot choc and home-made cake refreshed us. They also have a little shop of local goods so some Xmas shopping could have occurred. 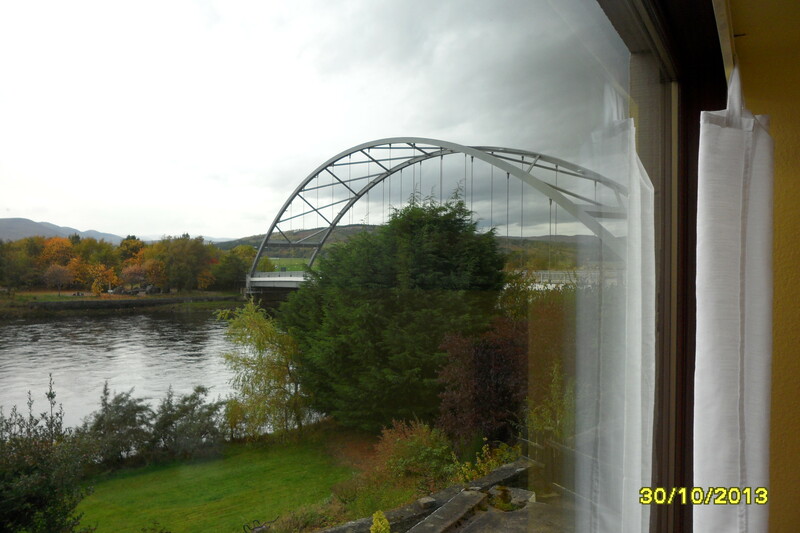 The photos show the view from the window, the little shop and the Bridge itself. Suitably refreshed, we turned round the end of Dornoch Firth, and then struck south onto one of the most infamous roads in Scotland…the B 9176 Struie Hill. I had never driven it before, but it is well-known on the weather forecast as one of the first roads in Scotland to be closed when snow hits. It is very twisty and steep so that it is bad enough negotiating it in good weather, but it must be a nightmare in December. Fortunately the snow-gates were open and we proceeded to some of the loveliest views in Scotland, down the Dornoch Firth……if you can find somewhere to stop, of course! The other problem was that there were a lot of dark clouds gathering, so the mid-afternoon light was not good, so we pressed-on via Alness, Dingwall, Strathpeffer (with the Highland Museum of Childhood…..well worth a visit), Contin, Garve, Achnasheen, and down Glen Carron, to the village of Lochcarron, our stop for the night. 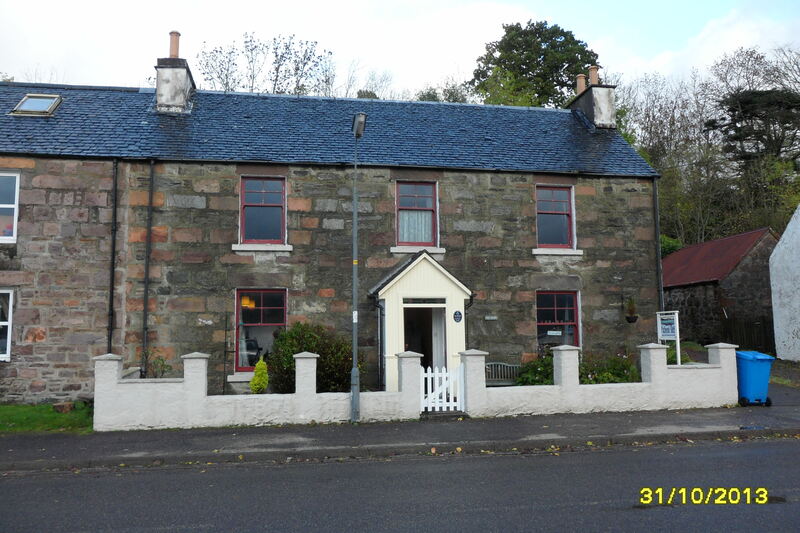 It’s not a big place, and is built on a main street, which separates it from the loch from which it takes its name. This time of the year most accommodation was closed for the season, so we were lucky to get booked at the Pathend House. 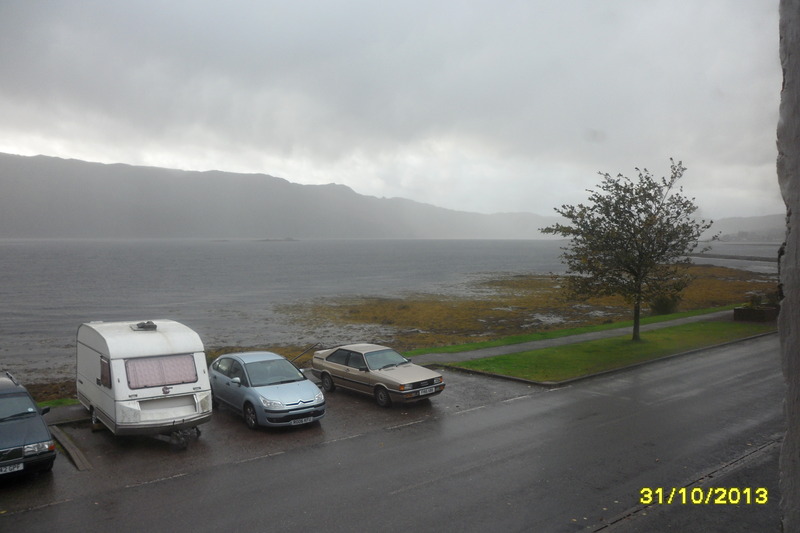 The local Hotel was near enough to walk-to so we went along in the rain, for an evening meal. 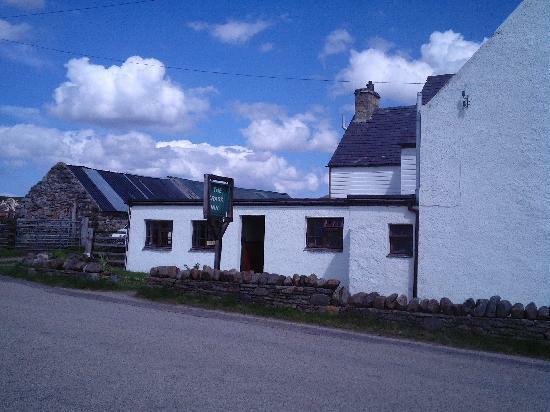 The bar, like most of these places is an entertainment in itself, with a dog wandering about, several ‘worthies embibing, the quiet bar-staff, and the owner chattering with some of the locals through the base of a whisky glass. If you ever watch the TV Series Hamish McBeth, then you have it in essence. Big portions of everything, and transport costs are said to keep prices high, but the vegetables, and no doubt the beef and potatoes were local…..or maybe they just saw us coming! My old mobile phone has served me well for many years, but with the advent of a new car (with Bluetooth) being delivered in the next few days, I was persuaded that perhaps I should move to the next technology step, so I now have a nice new shiny Nokia (not-just-a) phone. Being a man, I of course immediately took it out of the box, and after charging it up, I started looking at the controls and pressing buttons. However this turned-out not just to be a simple phone, as it had about 2 million functions and combinations of what I could do with it! It was therefore imperative that I study the supplied Instruction Manual. So I spent all yesterday evening wading through some 48 pages of small type giving me lots of sugestions as to how it would carry-out the multitude of functions I absolutely MUST use. I have managed to exclude all the irrelevant buttons and get down to half-a-dozen operations I actually need. My next problem comes when the car is delivered, and I have to connect to the Bluetooth. Hopefully one of our offspring will be able to guide me through the minefield! But why does someone not come out with a very, very, very, simple unit, which is just a phone? Sorry ! have not been about for a little time now but hopefully this will explain why…. A fair number of us have a monitor screen of some sort on our desk at work or in the house. You must have one or you would not be reading this! It provides another world into which we have to venture, a bit like Alice and her Looking Glass. But it also allows us access in both directions to the world at large. At one time we read books as a way into this other world, but now we need this window for both business and pleasure. So when this window is blanked-out for one reason or another, we feel very deprived. If we are watching a favourite TV programme, and there is a power cut, the loss of the viewing maybe annoys us just as much as the other inconveniences! Imagine how I felt when (two weeks ago today )my main work computer, which has served me well for some years, suddenly packed-in completely. Luckily I managed to get most of our stuff off it, and it was just to be a matter of getting a new machine and uploading the saved info……some hope! I needed a performance upgraded instrument with XP Pro…..but there are no machines with XP now available, so had to accept Vista. However the drivers are different, and some of my XP programmes will not operate under Vista! Also all my suppliers have specific programmes for the programming of the newer hearing aids; some can be used with Vista, some have upgrades, and some indeed have no plans to upgrade their information to Vista! To crown it all, the printer I was using was not compatible with Vista! So, Young Lady of the house did not see me much recently in the evenings while I struggled to get everything (or most) up and running. Blood pressure was at an all-time high, and I was probably more crabby than usual. Her patient and forgiving nature was to the fore however, and to be applauded. With the help of everyone, I am now catching-up with appointments, and after a relatively quite time in a business sense, I am now run off my feet again! However, the weather has been nice, the garden is looking reasonable, and the possibility of retirement gets a little closer! Then I will have a little more time to look at my little screen for pleasure! Just a simple phone call…..some hope!! At one time, if you had a phone, it was in the hallway. Then, a cold hall was not attractive, and an extension went into the living room; then one in the bedroom ….so a phone was always within a few seconds’ walk. Sometimes we might be out and miss important phone calls….so we got a recording machine to go with it. Some of us actually had a fax machine! If that was not good enough, the cordless phone came on the scene for those who did not want to even get up out of the armchair! Next step was to have an internet connection, then e-mails, so we could write to each other, then a web-cam, to see each other as we spoke, then broadband, so that we could down-load ‘stuff’ even faster, see every detail on the web-cams, and play faster games. I have handled all of these things so far, albeit slower than a primary-school pupil, but then a few weeks ago, I got a phone call (yes, a real voice, with a non-local accent) telling me that my broadband rental charge is being reduced by £3 per month! ‘Thank you’, I said, and was about to hang up when I was asked if I wished to subscribe to this facility. ‘Yes, thank you’ I said, and was about to hang up, when I was asked about delivery of the new equipment! ‘I don’t need any new equipment’, I said, and was about to hang up, when I was informed that I would benefit further by being able to make free calls at the weekend and the evening. I heard nothing for some time, then got two e-mails from BT that the facility was now activated, and did I have any trouble installing the router. ‘I don’t have a new router, but a quite efficient old one’, I said and was about to hang up when I was told that one would be sent free of charge! It eventually has arrived and lain for some time un-used, as weekends and evenings are when we want to escape from phone calls! I have now got it out and have been wading through the phone numbers, passwords and account numbers I am required to know instantly, when I need to phone the premium line for technical help! Mobile phone-users have not escaped this increasing complexity of life, as the Young Lady of the house, and I, must be the only local folk who do not have a camera on their phone! Please, Mr BT, and like-minded technical folk…..just let us get on with what we have, before I go bonkers and need to phone for an appointment to deal with my technical stress…. If I could just find the correct phone, number, password, NHI number,…birthdate, collar size, shoe size, car reg number………..